At HydronicHeating.net, we understand that homeowners are looking for quiet, energy efficient heating systems to keep their home comfortable and healthy for the entire family. Hydronic radiant heating fulfills that need and provides a smart residential heating alternative that will help lower your energy costs and impact on the environment. HydronicHeating.net provides information on the important topics associated with radiant heating and hydronic systems that can be used for your home. The articles below are designed to help you understand the benefits of this method of heating and answer any questions you might have. For those who are completely new to hydronics and would like to get an overview of why this type of heating system has become so popular over the last several years, this article will help you understand the advantages that radiant heat provides, and how your family can benefit from this modern energy efficient system. The principles of how hydronic heat actually works are explained here. Heat transfer, especially when it comes to heating a home, can be completed in many ways. While forced air systems have been prevalent for a long time, they are not the most effective means of providing consistent and comfortable warmth to the home. There are many options for designing your radiant system. The basic components of a boiler, liquid, plumbing manifold, tubing, and heat exchanger are the essentials, but there are several ways that this system can be installed and operated. From tankless water heaters to radiant floors to outdoor hydronic heat, you will be able to find a way to meet your home heating needs. "What are the benefits of hydronic radiant heat over other heating systems?" is a common question for those who are beginning their research for their future custom home or house remodel. 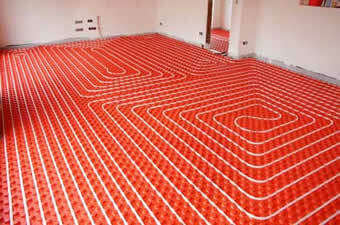 This article spells out step-by-step the many advantages radiant heating can provide to your home. The comfort features and health improvements associated with this technology, as well as the cost savings and versatility of installation are discussed in detail here. A topic that isn’t often discussed, it is important to be aware of the problems that can occur during the installation of hydronic flooring. This will help you to know what issues to look out for, while preparing you with good questions to ask your HVAC contractor. Hiring the right installers, coordinating and informing the different trades, and testing the system will help to ensure a successful installation of your radiant floor. Just as there are several options when it comes to the components of hydronic heating equipment, installing hydronic radiant heat in your home can be done many ways. Learn the difference between “wet” and “dry” installations, so that you get a better idea of what each option will mean for your home. Few things are more important in a construction project than the overall budget constraints and how to get the most quality for your dollar. Take a look at how hydronic systems compare in price to other types of heating. In addition, you will find tips on reducing the cost of installing radiant heat in your future home. Traditional forced air heating has been an effective means of providing heat for the home for decades. Find out how it stacks up against hydronic heat technology when it comes to comfort, healthy indoor air quality, costs, and energy efficiency. You may be surprised. Finally, a short list of the top suppliers of hydronic heating equipment, boilers, and radiant heating specialists is provided. This resource will help you to find installers and knowledgeable experts who can make hydronic heat a reality for your next home.